Extraordinary firearms and memorabilia owned by well-known politicians, presidents, and celebrities. The exhibit includes three presidential pistols, including a .44 Double Action Smith & Wesson revolver owned by Teddy Roosevelt, along with a belt knife used by “Teddy’s Rough Riders” during the Spanish-American War. Also featured is a .32 Safety Hammerless Smith & Wesson acquired by Franklin Delano Roosevelt when he was employed as an attorney in New York in the 1920s. 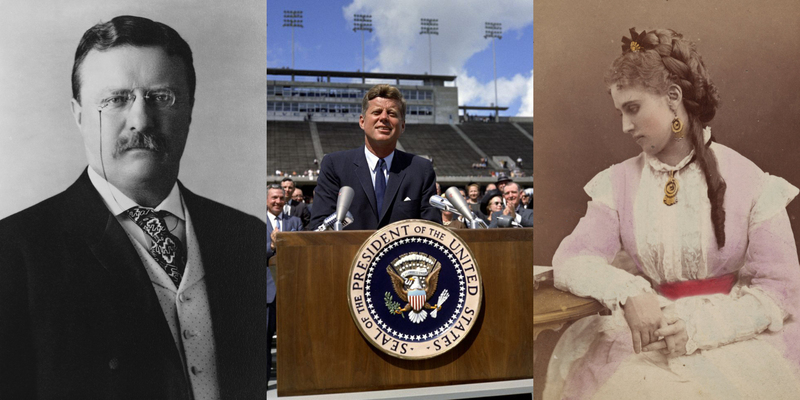 The third presidential weapon is a .357 Magnum made especially for John F. Kennedy, featuring the handiwork of master engraver Alvin A. White. The revolver is fully engraved and inlaid with gold and silver, and bears the Great Seal of the United States on the side plate. Unfortunately, Kennedy was assassinated before he could be presented with this marvelously manufactured weapon. 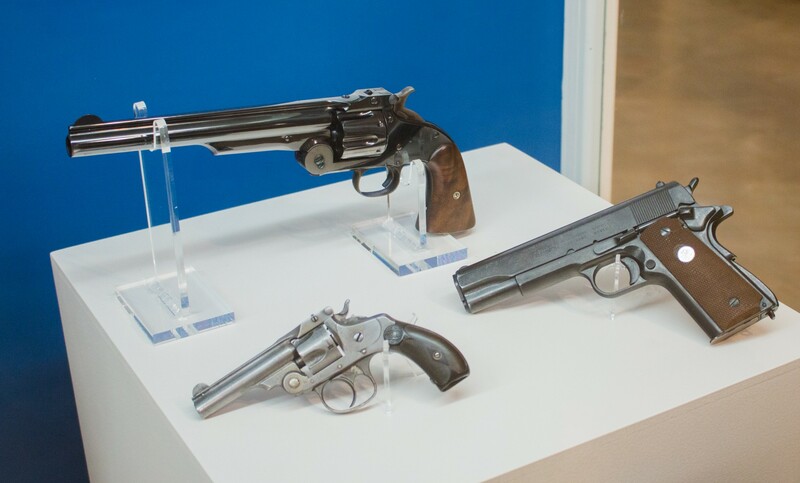 This exhibit also includes three guns owned or used by movie stars, including .32 caliber Smith & Wesson belonging to George Montgomery, well known for his career as a film actor in many westerns. Clint Walker, best known as the star of the Cheyenne TV series, owned a Smith & Wesson Model 3 that is on view. Also on display is a prop gun designed to look like a .45 caliber U.S. Army automatic pistol used by Lee Marvin in the film, Delta Force in 1986. 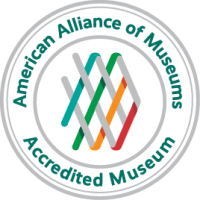 Probably the two most famous gun makers in the history of this country are Horace Smith and Daniel Wesson, and this exhibit features firearms connected to both of these innovators. A pair of .31 caliber target pistols, hand-made by Daniel Wesson at the end of his apprenticeship in 1847, are excellent examples of mid-nineteenth century craftsmanship. Horace Smith is represented by a Model 1 ½ 2nd Issue given to him upon his retirement in 1874. 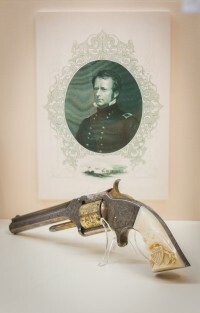 This is considered to be one of the finest engraved pistols ever made, and features extremely rare engraved pearl grips. 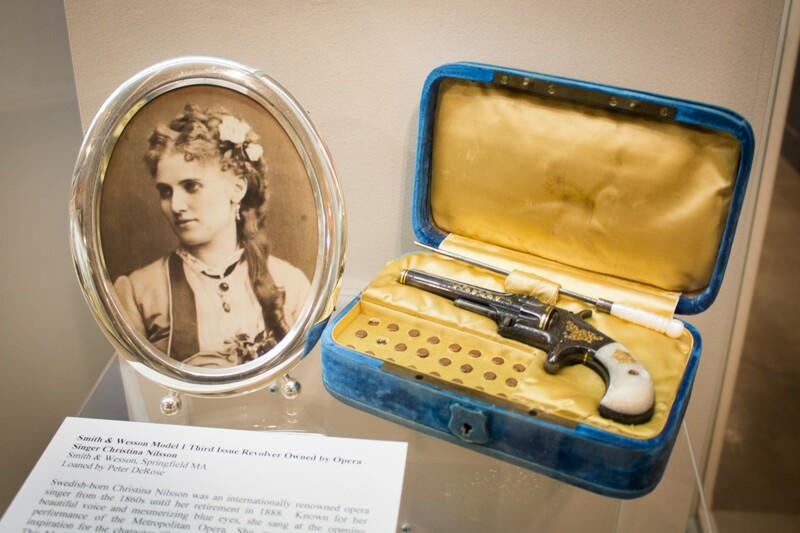 Other firearms featured in this exhibit include a Smith & Wesson Model 19 .357 Magnum owned by FBI Director J. Edgar Hoover, the target rifle used by Theodor Robert Geisel (the father of Dr. Seuss), and a Model 1 Third Issue Smith & Wesson owned by Christina Nilsson, one of the great opera stars of the nineteenth century. Organized in cooperation with the Smith & Wesson Collectors Association.